We found Supernews to be a Usenet Service provider with everything you need. They provide Usenet Access with competitive pricing, superior performance and simplicity. Their Usenet Service doesn't offer a lot of extra bells and whistles but just a very solid Usenet Newsgroups Service. They have operated Usenet servers since 1995 and is one of the oldest Usenet companies in the world. For over 15 years they have provided customers with safe and secure Usenet access. Supernews offers the Best Usenet Service value for your money. They also allow 3 Day Free Trial. Supernews offers free trial to all new customers. The trial period is 3 days . They don't offer a free trial with discounted pricing that Usenet.com is offering you. If you are considering them, then you probably know about their reputation for quality. Supernews has 4,602 days of text retention and 2,357 days of binary retention. It also has 100% completion. Retention grows every day – day by day – to give you complete Usenet access. This means you never experience downtime or missing articles. Unlike other Usenet providers, they make all articles available at unlimited speeds – regardless of the age of the article. They are regularly upgrading their retention rate for binaries. A connection, or concurrent connection or stream, refers to a session that your news client opens with their servers. Having multiple connections open at the same time allows you to browse newsgroups while your client also downloads queued articles. Multiple connections helps you maximize your download speed.allows simultaneous connections The speed offered and amount of data transferred is unlimited. You can maximize on all the bandwidth that is at your disposal. Please Note – They do not provide support for any newsreader software. The SuperNews NNTP news server address is: news.supernews.com Access to SuperNews servers requires username and password authentication. You may authenticate manually each time you use your account or configure your newsreader program to automatically authenticate your account. All you need to do is enter your username and password and your ready to enjoy your account. It is that easy! Combine these features with unlimited Usenet access for under $10 a month and you’ve got a winning combination. The “newspaper man” legend continues. Performance has never been an issue with them. You can expect broadband speeds at all hours of the day and days of the week using either standard and SSL ports. They have server farms located in the US and Europe to maximize performance. They help ensure your privacy with 256-bit SSL encryption. This feature is offered free of charge to all customers. Supernews also offers up to 30 simultaneous connections which ensures reliable speeds. We were able to max out our cable Internet connection with only a handful connections. When questions arise you can rely on their 24/7 tech support. Bottom line – They offer fast, reliable Usenet service at a good price. They don’t have some of the extra features like a Usenet client, VPN, or online storage that come with some other services. If you already have a favorite Usenet client and don’t need the extras then I recommend Supernews. The service is a good value at $9.99 a month. Download rates are not limited. The only limiting factor would be your ISP as Supernews is connected directly to the Internet with server farms in the USA and in Europe. Overall a very good Usenet experience. offer a very good price performance. Supernews is a Usenet veteran. Having been around since 1995. You can expect to max out your Internet connection with them. As it supports speed in excess of 100 Mbps. With up to 30 connections allowed. Content Propagation: Supernews is highly peered so posts are quickly propogated. Support: 24/7 online tech support. Spam Prevention: They offer a 100% unfiltered feed. They have watched Usenet evolve over the last two decades and they have maintained a reliable and affordable service for their customers. 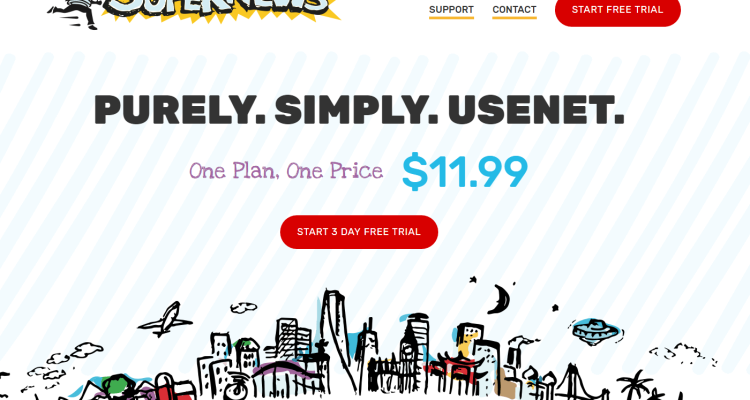 Supernews only offers one plan for usenet service: an unlimited, no limit, no restrictions, and no-holds-barred plan at an affordable price. Their comprehensive unlimited service with no rate limits or download restrictions makes it extremely easy to understand for new customers. While other providers are sporting a catalog of plans, sometimes with more than dozen different offerings, Supernews keeps it simple. One plan, no limits, no for one low price. Their unlimited plan does not have a transfer limit, nor does it have a speed limit. So there’s no reason why you shouldn’t be able to get maximum reward from the service. Supernews service is top NOTCH. They provide SSL with all accounts, and do not censor any newsgroups or posts – both of which are the industry standard. The number of simultaneous connections they offer is also very competitive when compared to the rest of the providers. All in all, Supernews is living up to their byline: Purely. Simply. Usenet.